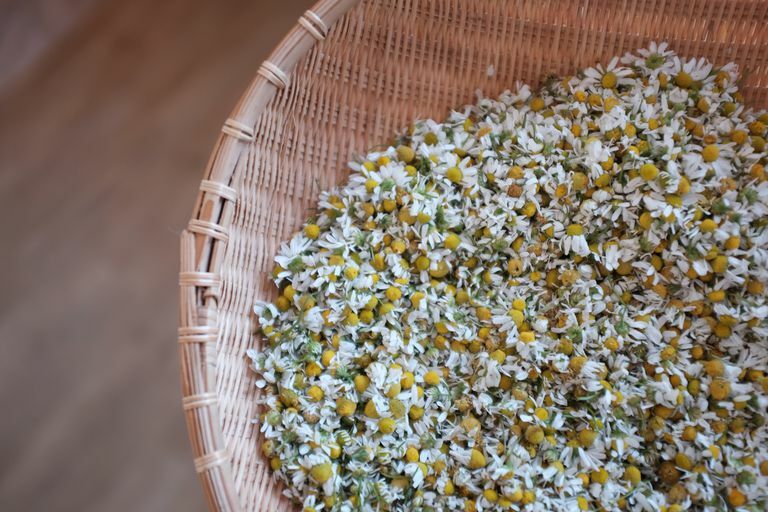 Chamomile supplements haven't been tested for safety and keep in mind that the safety of supplements in pregnant women, nursing mothers, children, and those with medical conditions or who are taking medications has not been established. Be sure to learn about using supplements safely, and if you're considering the use of chamomile, talk with your doctor first. Aspirin may theoretically interact with chamomile, which contains anticoagulant compounds called coumarins and increase the risk of bleeding. Platelet inhibitors are used to reduce the risk of heart attack or stroke and for patients who have had a coronary stent implant. Chamomile contains anticoagulant compounds called coumarins. When combined, they may increase the risk of bleeding. Warfarin is derived from coumarin, a compound with anticoagulant properties also found in chamomile. Chamomile tea was found to cause internal bleeding when combined with coumarin. Tricyclic antidepressants are metabolized in the body by the enzyme CYP1A2. Chamomile has been found to inhibit CYP1A2 and may theoretically increase blood concentrations of tricyclic antidepressants, increasing the risk of toxicity. Clozapine (Clozaril, Leponex, Fazacio) is metabolized in the body by the enzyme CYP1A2. Chamomile has been found to inhibit CYP1A2 and may theoretically increase blood concentrations of Clozapine, increasing the risk of toxicity. Propranolol (Inderal) is a beta-blocker used to treat high blood pressure. It is metabolized in the body by the enzyme CYP1A2. Chamomile has been found to inhibit CYP1A2 and may theoretically increase blood concentrations of Propranolol, increasing the risk of toxicity. Theophylline (e.g. Theo-24, Theolair, Bronkodyl, Slo-bid, Slo-Phyllin, Theobid, Theo-Dur, TheolairSR, Uni-Dur) is a bronchodilator used to help people with lung conditions breathe easier. It is metabolized in the body by the enzyme CYP1A2. Chamomile has been found to inhibit CYP1A2 and may theoretically increase blood concentrations of Theophylline, increasing the risk of toxicity. Tacrine (Cognex) helps treat symptoms associated with Alzheimer's disease or dementia. It is metabolized in the body by the enzyme CYP1A2. Chamomile has been found to inhibit CYP1A2 and may theoretically increase blood concentrations of Tacrine, increasing the risk of toxicity. Cupp MJ and Tracy TS. "Cytochrome P450 new nomenclature and clinical implications." American Family Physician. 57.1 (1998):107-16. Ganzera M et al. "Inhibitory effects of the essential oil of chamomile (Matricaria recutita L.) and its major constituents on human cytochrome P450 enzymes." Life Sciences. 78.8 (2006):856-61. Maliakal PP and Wanwimolruk S. "Effect of herbal teas on hepatic drug metabolizing enzymes in rats." Journal of Pharmacy and Pharmacology. 53.10 (2001):1323-9.